When we clean your carpet we are not only removing dirt from your carpet. We are removing many contaminants that cause allergies. Its very important to have a carpet cleaning frequency routine to keep your carpet looking its best, to prolong the life of your carpet and to create a better indoor air quality for your family. Have you ever seen a Dust Mite? Probably not because they are microscopic here in the picture you can see how they look and yes they are in your carpet, mattress, upholstery. We pre-vacuum your carpet with true HEPA Commercial vacuum cleaner to removed very small particles that cause allergies. One of the particles that is very important to removed is dead skin cells. Did you know that the average person sheds about a gram and a half of skin each day, which cover an area roughly the size of a dollar bill. These particles are very small and they get deeply embedded in the carpet, upholstery, mattresses, pillows, and bedding. Dead skin cells are the food source for dust mites. 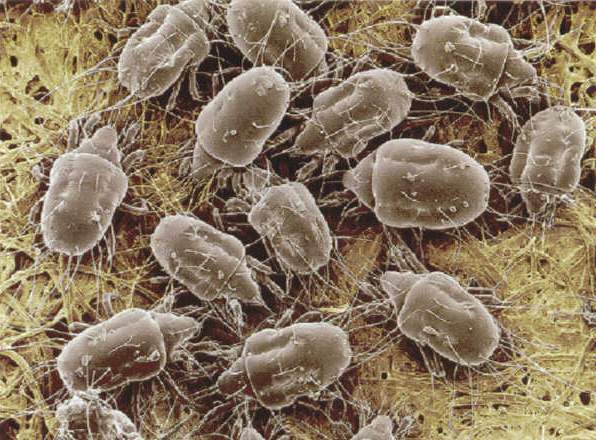 Dust mites have a very potent allergen in their droppings that is thought to cause up to 25 percent of allergies world wide.